Since I’ve started using my bullet journal I’m finding it much easier to stay organized. Well, maybe not easier, it does take some practice, but at least everything’s in one place now. I know there are some people out there who love tracking their money but I am definitely not one of them. I want to ignore it all and just hope that it’s there when I need some! 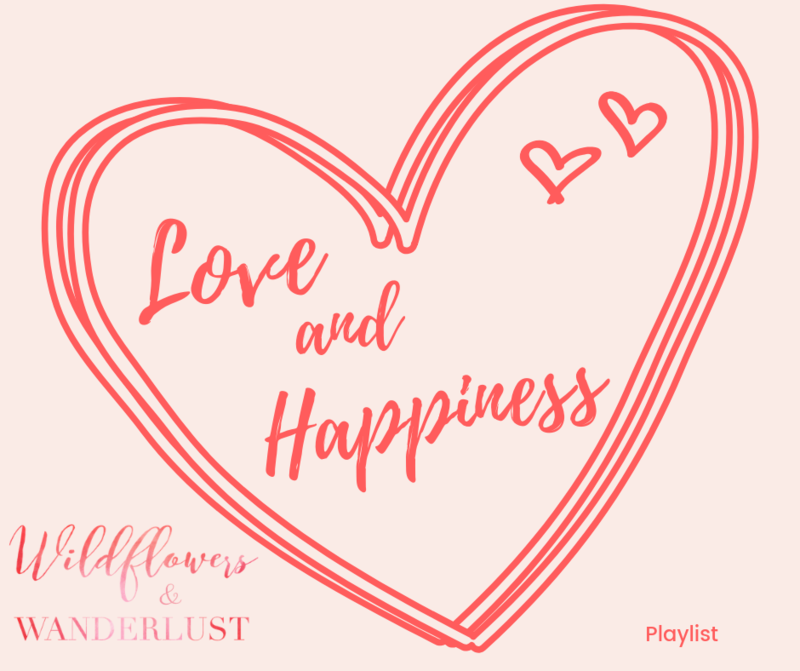 But back to reality, I do understand that I have to keep track of my budget somehow and making it look pretty with checkboxes and flowers makes it much easier to keep my attention. 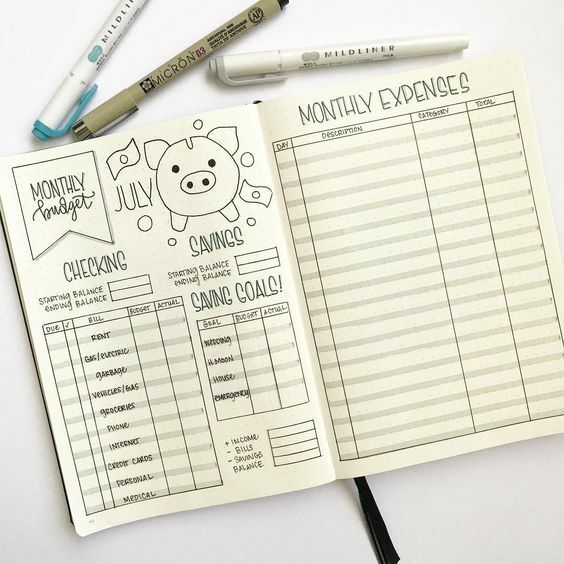 I’m researching a lot of different ideas about bullet journal budget and expense trackers. I’m hoping that some of these will inspire you to start tracking your budget, expenses and savings too. Remember that the whole idea behind a bullet journal is to make processes easier, so pick something that’s easy to use. It’s not going to work if you don’t use it. There are two steps to using financial trackers, you’re going to have to start by tracking you money and then you can set some goals. I’ve sorted the list that way to make it easier for each stage. You have to start at the beginning before you can more onto more advanced. Or at least that’s the theory. If you’re not keeping a budget right now, you might want to start off with an expense tracker or a bill tracker. Once you get a feel for tracking, add in some goals and more advanced savings plans. 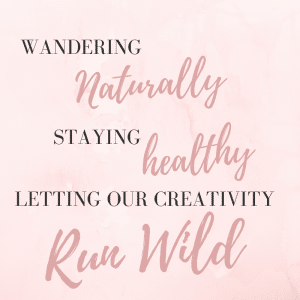 Here are some ideas for you to check out and see which ones will work for you, or which ones inspire you to build something of your own. 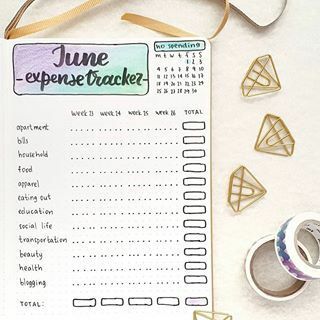 This is a one page Monthly Budget Expense Tracker by @Journal.It. It’s easily divided into weekly columns so that it can be updated throughout the month. Alla changes her design each month but her format remains largely the same, with weekly columns and totals that are updated throughout the month. Adding in your expenses each week makes it easy to sit down one day a week and add up your receipts. This tracker by @cardigansandchamomile is a step forward from just tracking your expenses. It has an overview of her budget on the left and plenty of room for tracking on the right. You could take this idea and use one page to track daily or weekly expenses when you’re ready to get that detailed with your tracker. There’s plenty of room to record all the information that you need for tracking your budget here. Be sure to put in the date a bill is due or the date that it’s withdrawn automatically from your account. Then you can check it off when it’s paid. This is a great way to keep track of all the money coming into and out of your accounts. You have to know this to be able to set goals for your finances. Getting all this information down on paper may surprise you, you might not realize where all your money is being spent if you’re just checking your balance on your phone screen. It’s time to set some goals. It’s been proven over and over that if you write something down (set a goal) you are more likely to achieve it. Let’s get those goals down on paper and start working toward them! These are the trackers and journals that will help you reach your money goals. These goals can be for saving money, you can save for a long term goal or just for a weekend trip. They can also be goals of paying down debt or building a long term savings account. 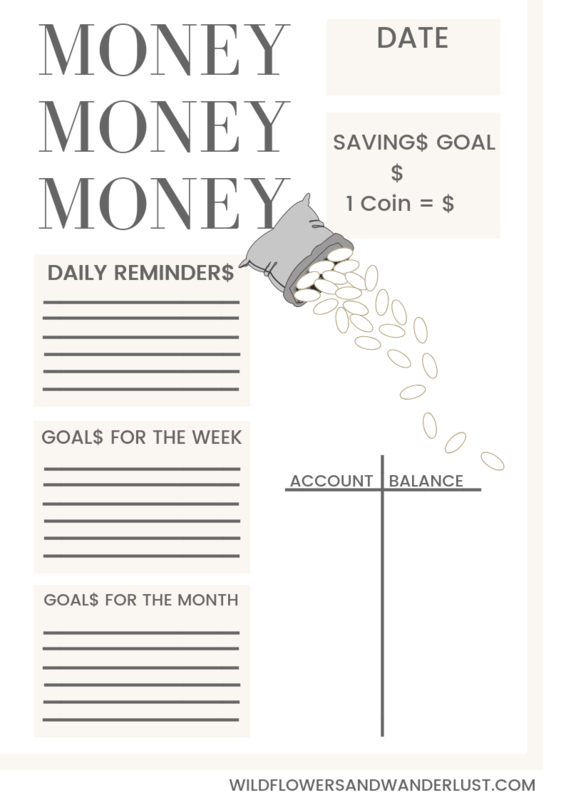 This is a fun to use savings tracker from Pinterest. 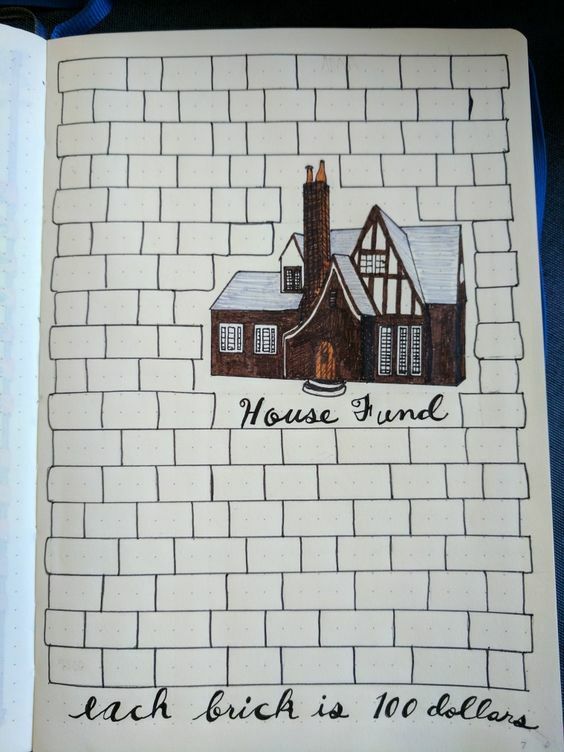 If you’re saving for a large expense, like a house, you can watch your savings grow by coloring in the bricks. In this example each brick is worth $100. I know you creatives can come up with so many ways to modify this for whatever you’re saving for. 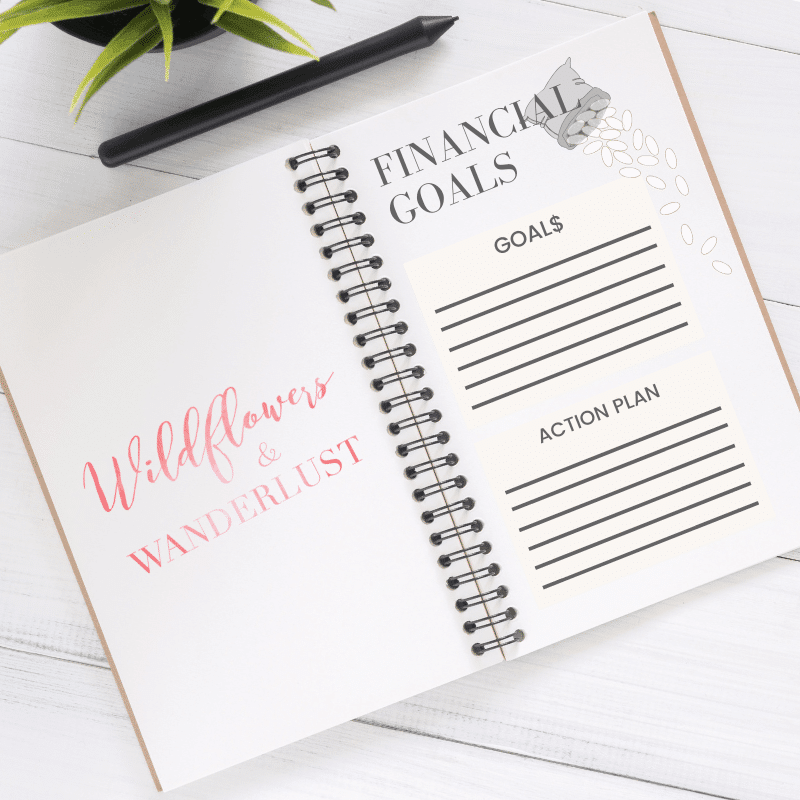 This is a great Budget Planner that you can fill in for any type of financial goal. Choose one, two or three goals to concentrate on and make them happen. Pick a financial goal and set a timeframe to reach it. Be sure that you’re setting a goal that you can reach, not something impossible. Break that goal down into manageable chunks and figure out how you can reach it. If your goals is to save $1000 by Christmas, that’s less than $100/month that you need to save. Break it down by the week or by the paycheck and then note how you can achieve it. If you take your lunch instead of eating out or skip one activity per week you’ll be able to save that money and mark it on your tracker. Download here as a PDF to use until you create a version that works for you! 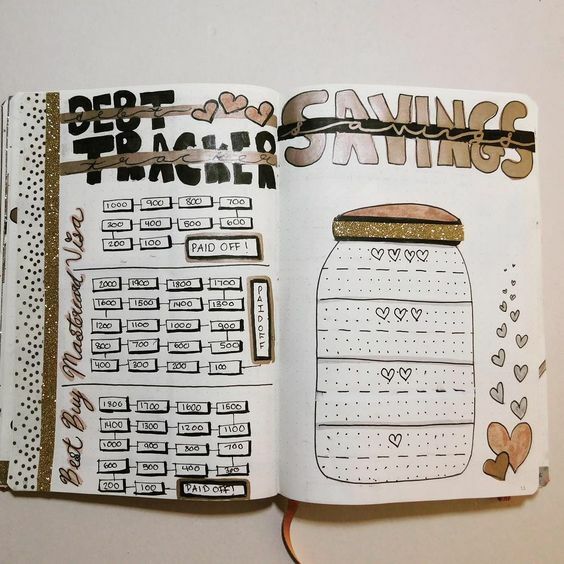 This Bullet Journal Debt Tracker by @sydneysbulletjournal is on one page with a Savings Tracker on the second page of the spread. Whether you have student loans to pay off, credit cards or a house payment, this is a great visual to show your progress on paying these items off. No goal is impossible to reach and setting the goal and committing it to paper is a great way to make progress toward it. I know once you start bubbling in these squares you’ll be super motivated to finish! Here’s a cute idea for saving up for an emergency fund. 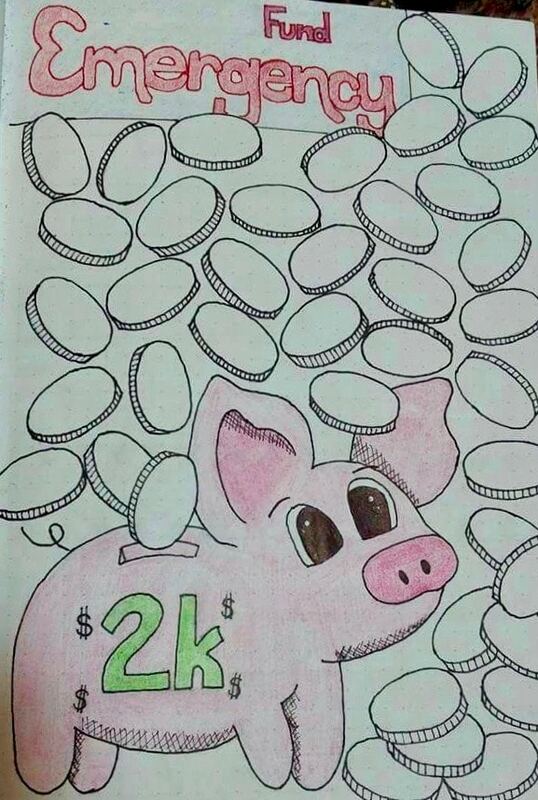 Take random amounts and place them on each of the coins and then color those in as you add that much to the fund. They can be as small as $1 and as big as you’d like. The goal is to get that emergency fund built up. An emergency fund is not really a luxury, it’s a necessity. Unexpected expenses can blow anyone’s budget and take awhile to recover from. This tracker helps motivate you to save for those budget busters that are no fun. The next time your car breaks down it won’t be quite as stressful if you know you’ve got the money in the bank to cover the expense. Which of the Bullet Journal Budget Trackers did you like the Best? We all have bills to pay and we all need to have systems in place to take care of them. Money is a tool that we can use to improve our lives. This requires us to be mindful about our money but we don’t need to obsess about it. 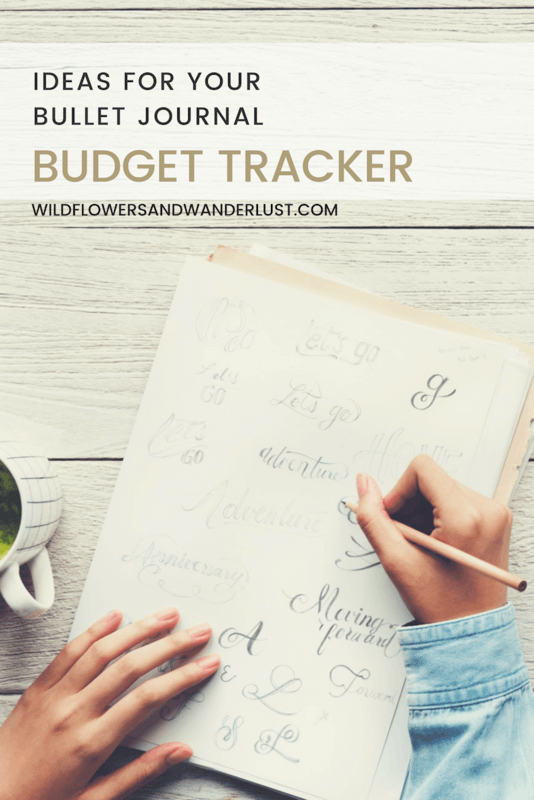 Using these trackers can help you get your budget in line and help you set up some long term goals. Once you start using a system, you will find that it’s much easier to set and reach your goals. That’s the beauty of goals – they set a bar for your to reach. You can start with a few short term goals and once you reach them, well the sky’s the limit! Here’s to your bright future and financial freedom! Be sure to save this to Pinterest so you can find it later and check out some more Bullet Journal Hacks. « What is a Bullet Journal and Why Do You Need One?